Just asking for 2 more places. Advise if you know. 1)Watch the weather, as in android. Beautiful black in this same style. For CPU temperature, I don't have a good desktop widget for that. I am using Speedfan, which does have a tray icon. For weather, CPU load, memory, wifi, battery, calendar, and trash bin, I am using the old Yahoo Widgets. Whereas you may be able to find an installer for the base engine application, the actual widgets to use with it may be difficult to find, and some, like the weather widget, near impossible to find one that actually still works. If you like anything you see in this screenshot, let me know and I'll see what I can do to give you more info, or a source to acquire them, if necessary. For the weather widget, I may be the only source for the one shown on my desktop, that actually works, since I had to decompile it and fix it myself. There is a desktop bar that contains all the widgets in your collection, which is what is showing in your screenshot. 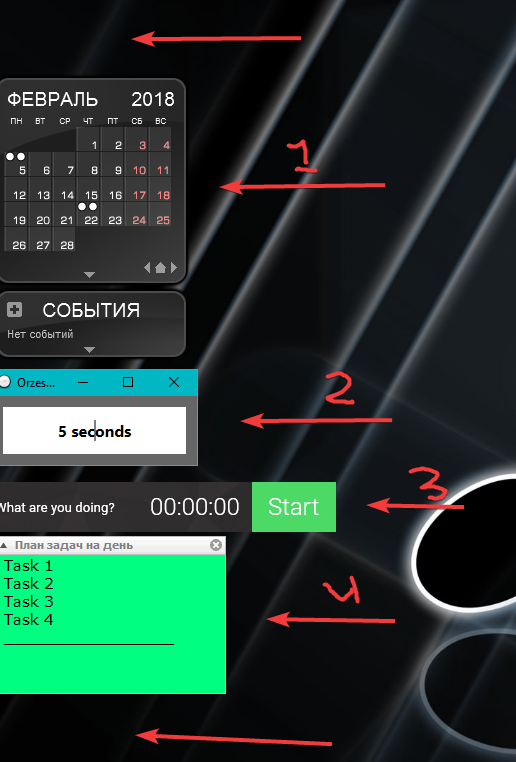 You need to open the widgets from there, to display it on the desktop like I have them. Then you can close that toolbar so that it stays in the tray as just an icon. The open widgets will remain on the desktop, unless you close the whole widgets application or the individual widgets. Attached to this post you will find my fixed weather widget. Keep a backup of the zip file, after extracting it, in case you should need it in the future. Then just click the extracted widget to open it. Unless you have changed the widget engine's default settings, it will ask if you want to move it to your collection. The answer is yes, move it, overwrite the original existing widget, whatever it wants. Once the non-working widget has been replaced with this one, you should be good to go. One note about this. I only replaced an old dead yahoo.com URL in the original widget code with one from weather.com that works. The weather widget will occasionally crash if/when it receives bad feed data from weather.com, which is something I have not fixed (and do not plan to). I am not sure which clock you are referring to, since there are 2 on my screen.